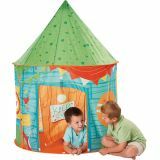 Boys and girls will love their very own clubhouse large enough for 2! With 2 mesh windows for spying outside and a flap door for privacy, it's easy to assemble. Zippered storage bag included. 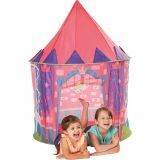 Sturdy construction with 2 mesh windows and flap door, this princess castle tent is easy to assemble and large enough for 2 to play! Zippered storage bag included.